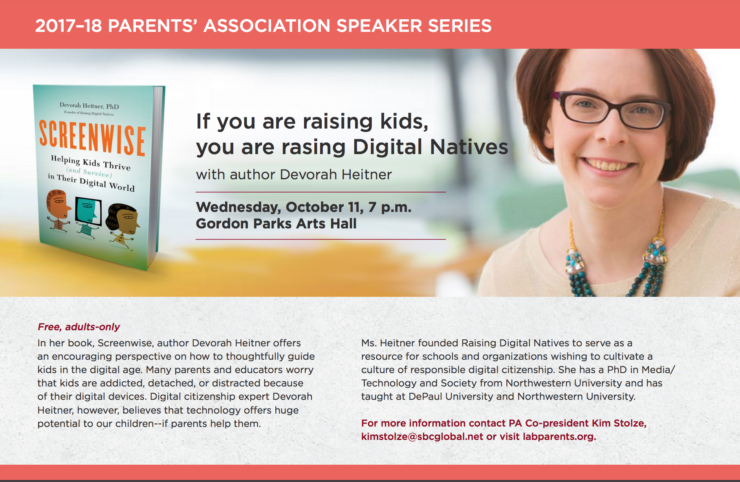 An experienced speaker, workshop leader, and consultant, Devorah Heitner founded Raising Digital Natives to serve as a resource for schools and organizations wishing to cultivate a culture of responsible digital citizenship.Her book, Screenwise: Helping Kids Thrive (and Survive) in Their Digital World is a guide for parents to mentoring digital kids. Her curriculum: Connecting Wisely: Social Emotional Insights and Skills for Plugged in Kids is used by many schools. Ms. Heitner has a PhD in Media/Technology and Society from Northwestern University and has taught at DePaul University and Northwestern University. She is delighted to be raising her own digital native, too. RSVPs to this event are highly encouraged. This is a free, adults-only event, and childcare (for children ages 3 and up) is available. If you would like childcare, please email Amanda Norton (amanda.may.norton@gmail.com) by October 9, 2017.For more information on this event, and other P.A. Speaker events, please contact PA Co-president, Kim Stolze.